In Ruddington we are able to offer our two rooms for this purpose during the hours of 8am to 11.30am and 2pm till 5pm. Guests are all welcome to stay for lunch with us but we will open the rooms between 11.30 and 2pm to other customers. *We ask for a minimum spend on the day. ...that are a little bit different. Modern, industrial style meeting spaces in a unique building dating back to 1753; the perfect location for conferences, professional training and business meetings. Take advantage of flexible layout options, wireless presentation screens, WiFi and media outlets. 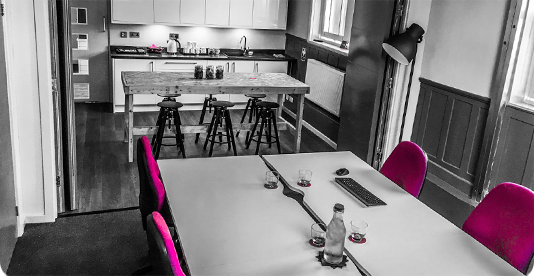 Our meeting space can accommodate 4 - 30 people and includes a breakout area with tea and coffee making facilities. Business lunches can be arranged on request from Philo's. We are a family run business that prides itself in providing homemade quality lunches throughout the Ruddington and West Bridgford area, all of which are delivered in a fully refrigerated van. Philo’s business lunches bring the most delicious sandwiches, canapés and cakes directly to your doorstep. We are here to help you cater for all sorts of occasions, whether a business meeting, product launches, entertaining friends or funerals. We fully support our local communities both in Ruddington and West Bridgford and we really appreciate the loyalty of all of our customers. Philo Mills was an American Architect who lived and worked in Ruddington in the early years of the 20th Century. He was a brilliant entrepreneur, he built many of the homes and shops in the village, including our first Espresso Bar and Eatery. Philos was purchased by the Towne family in 2006 and has recently celebrated its 10th successful year. We have a fabulous family ethos at Philos, with several members of the family being with us for the whole 10 years. delivered in a fully refrigerated van between 11am and 12 noon. Other times can be arranged upon request. The most delicious sandwiches, canapés and cakes delivered to your doorstep. Breakfast menu available on request. 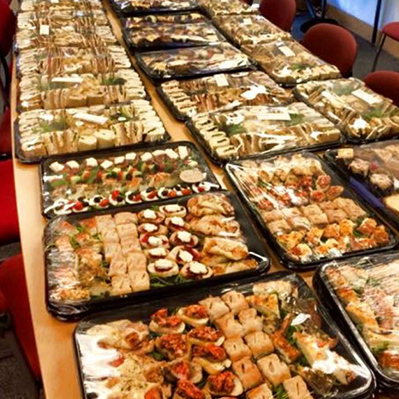 We are here to help you cater for all occasions whether a business meeting, product launch or special event. A choice of menus (if there is anything we can do to make your event even better, please let us know). Extremely happy tailor special ingredients to personally suit your needs or dietary requirements. Due to our personal, friendly, family service we have become very busy looking after families during their difficult times. We tailor our business menus to suit the family numbers, needs and budget. Once again we are happy to deliver our beautifully presented food to the venue. If families wish for an extra pair of hands on their difficult day we can arrange for our Philos staff to come make teas, coffees and ensure that the day runs smoothly, without any worries to the family. If you would like our help on your day then please contact us and we will be in touch immediately or please do feel free to come into either the Ruddington or West Bridgford shops to discuss arrangements face to face. 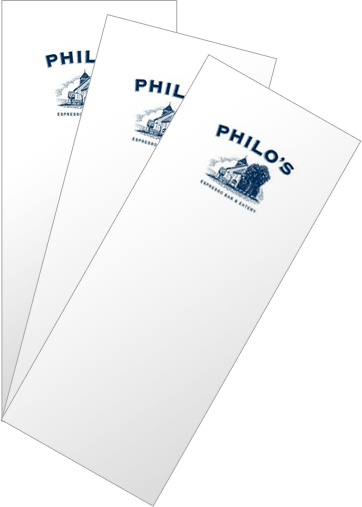 Philos have catered for many events, including Christenings, special birthdays and family gatherings. the upstairs private room (approximately 20 people seated) or outside during the summer on our lovely decking area. We are really happy to discuss any occasion whereby you feel Philos can help you on your special day. either the Ruddington or West Bridgford shops to discuss arrangements face to face. We have a choice of menus but if there is anything we can do to make your lunchtime even better, just let us know! We are very happy to tailor ingredients to personally suit you. We are frequently visited by groups who wish for a private meeting room. At Philos we have three main suppliers, Sophie Allport, The Old Basket Supplier and Voyage. We rotate our suppliers to ensure variety of our reasonably priced gifts for our customers. We have gifts to suit all family occasions, teachers presents or even for your own home. Perfect! Christmas is very special at Philos, all of our shelves are bursting at the seams with decorations and gifts. We also attend many local Christmas Fairs. Please see our Facebook page for details. 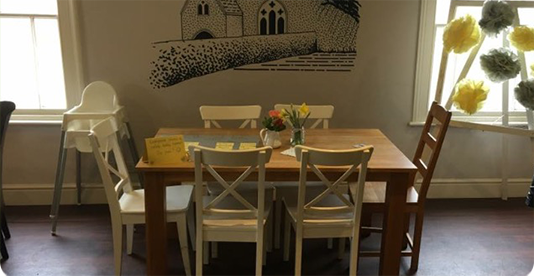 "All of our guests commented on the quality of the food at the Christening , and it really enhanced what was a very special day for our family." "A big thank you for allowing my friends to throw my baby shower at your Ruddington deli. Everyone was impressed by both the food and the fab job you all did!" "Thank you for doing such a good job with the food for the funeral, it’s a difficult time and it really helped us out on such a sad day. We had so many lovely comments." To contact Philo's, please email us at hello@philosdeli.co.uk. 22 Tudor Square, West Bridgford, Nottingham, NG2 6BT. *For lunches for over 50 people, 48 hours notice would be prefered. Special requirements: eg. vegetarian/vegan/gluten free/allergies?